Posted by cath in growing your own, Info and Cooks Notes. This year I’ve been growing more fruit and veg as well as the usual selection of herbs. Here’s a summary of what’s working, and what hasn’t! Tomatoes have been a very exciting first for the bay window space. I got two small plants from a friends allotment greenhouse and I’ve seen them grow big and bushy, flower and set fruits. 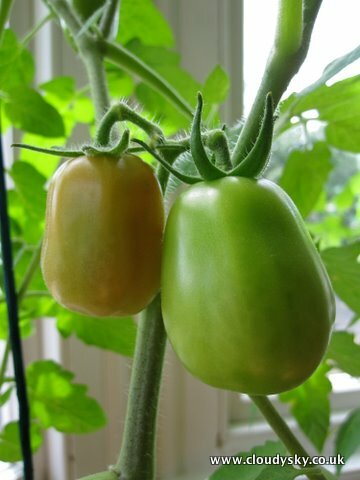 Finally, there is the exciting prospect of actually eating my own tomatoes as one is starting to ripen. As well as two bushy tomato plants I also got a selection of tomatillos. They have very exciting little flowers, but alas so far no fruit have set. They have also grown a lot :) and I’m still keeping my fingers crossed that something will happen! I’ve got a pepper plant. It’s small compared to the chillies I grew from seed, but I’ve been pollinating the first flower this week, and have high hopes for a large green pepper – and if I get one, I’ll be sure to take a picture! Bay tree, basil, greek basil and chives are all doing well, as are my various mints. This year I let my favourite mint die back in winter and I cut most of it away. It sprouted quite early in the year but is quite tough compared to my new mint plants. I also took a cutting of some very nice mint from my friends garden in Biggar and this has settled in nicely to indoor living. Now the big failures! I finally took the plunge and went outside to grow! A friend gave me a courgette and 5 broccoli seedlings in June and after a while I hardened them off in the stairwell under the skylights and then outside – but I went for plant pots so as not to disturb the shared garden. Sadly, I’d never noticed what a snail and slug haven the garden was until now and my courgette was gone within about 48 hours! The broccoli was also ravaged, however, two of the plants were slightly stronger, and although not looking very pretty – they have survived the snail feast and seem to be growing slowly. We’ll see! As for my courgette planter, well! I’ve ordered some rocket seeds and some copper strip and I’m going to try again with an August late summer salad crop with the slug barrier in place I hope this will be a return to success! With a view to getting a lot of courgettes from my plant (too much forward planning perhaps? ), I’ve been experimenting with courgette recipes to tempt my partner who was highly dubious about eating them. Good news is that he is now tucking in once or twice a week and I’ll post the recipe soon (once I’ve perfected it of course). Hope some of this has inspired you to go out there, try growing your own…OK it doesn’t always go to plan, but its fun anyway. Not to mention very delicious and rewarding when it does work! Cookalicious first got the chilli growing bug some years ago. We love chillies here and growing your own is great. I’ve been growing them again this year and have had a bumper crop already. I even grew some of last years’ fruit seeds with all 5 germinating and growing well in various homes including my own! Here’s a look at the chillies I’ve been cropping and eating thus far…delicious. This meandering chilli plant has been on the go for ages! It was actually bought 3 years ago from Phantassie at the Farmers Market (I think it was called ‘Ring of Fire’!). This year it’s growth has been remarkable as I was about to throw it away in early spring – then went away for 5 days and returned to leafy new growth. A quick prune and it has been happy as ever. My other plants are doing well and I’ve just started harvesting fatter, rounder chillies from them, you can see some fruit dangling temptingly from the branches. These chillies are from last year, and again the Farmers Market. Again barely seeming to survive the winter, they also sprouted again unexpectedly later in spring – worth hanging on to. I just give them a good prune of the dead and any weaker stems during early to late spring and see what happens. I was not very careful storing my dried red chillies and can’t remember which came from which plant, so the 5 seeds that I’ve grown could have come from any of these chilli plants – oops. 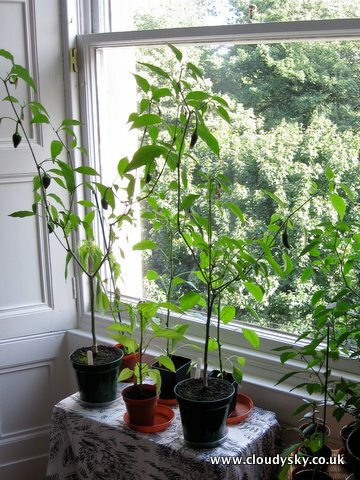 This year I’ll aim to keep a chilli from each plant in a separate envelope so that I can grow some of each as the older plants need replacing. 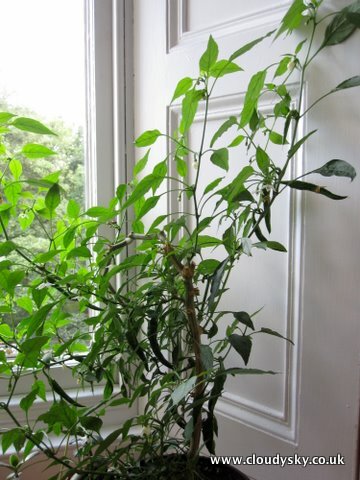 Still, it was very exciting and remarkably easy to grow from seed (indoors this is), and I would really encourage all chilli eaters to give it a try. 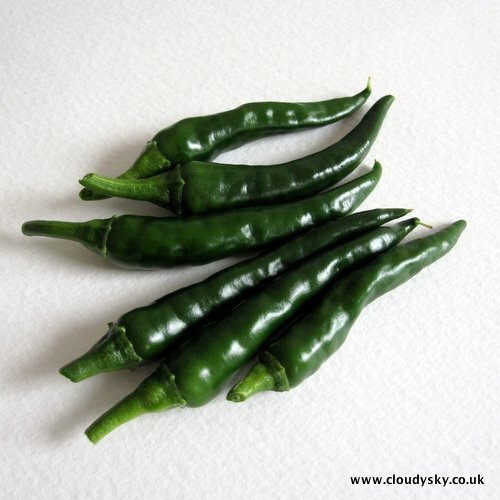 Fresh chillies – you just can’t beat them for heat and flavour. 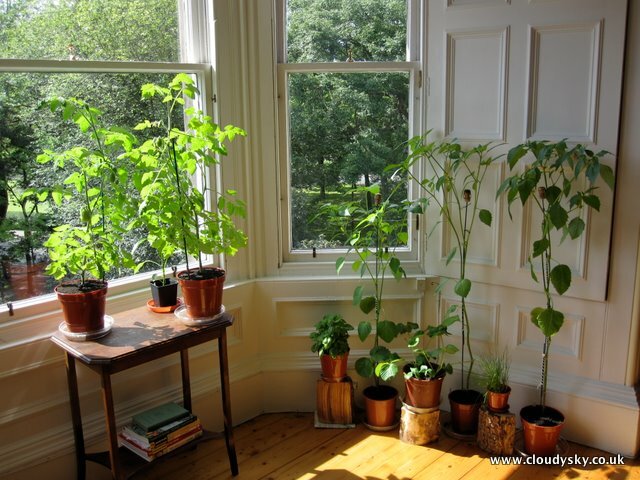 Growing the plant from home-grown seeds – well that just completed the cycle and has solidified my need for more growing space. More on that in the next post.